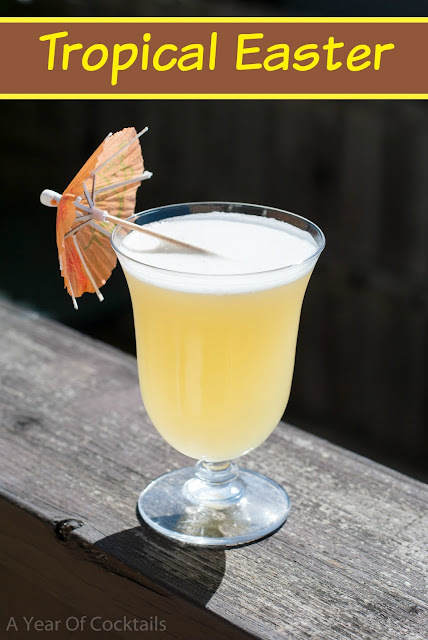 A cocktail blog filled with cocktail recipes, reviews and giveaways. Also includes an occasional mix of food and alcohol. I started off the day with my mad dash to drop off one of my girls, drive up the hill (in the snow......uphill both ways.....for dramatic effect), park and walk our youngest girl to school. Put her in her spot, gave the teacher a Hi-Five and took off back down the hill to pick up our oldest daughters glasses and my phone and hurry back over to her school to get her glasses to her and meet my folks in the MUR (Multi Use Room) for her 1st grade performance of Stone Soup. OH MY GOODNESS, it was the cutest thing ever!! The entire 1st grade class was part of the Stone Soup play! There was singing, and talking and announcing and acting.....I was extremely impressed! Some of the kids sang solo, and they were REALLY good!! What a fun way to start the day! Knowing Easter is on Sunday (but honestly not sure how we got here so quickly) I knew I needed to make a fun cocktail for you all.......you know......to give you options and all. I have been thinking of my banana liqueur for a while now.....and decided that I needed to make a fun cocktail with it. I present Tropical Easter, b/c I think Easter should be tropical sometimes. It's delicious.......I mean it has banana liqueur in it! I hope all of you that do celebrate Easter have a wonderful time! We are hosting here (which we do every year) and having my family and my husbands family over. We always look forward to it!! For those of you not celebrating, have a fantastic weekend!! In a shaker, add ice and all of the ingredients above. Shake well and strain so that you get a good froth on the top of your cocktail. Here's to the weekend! May you have amazing weather and delicious cocktails! Hello! My name is Jen and I am The Cocktail Lady. I am a married mom of 4 who loves creating and trying new cocktails. Welcome to A Year Of Cocktails! I'm Jen, The Cocktail Lady. I'm happily married with 4 kids and love creating fun new cocktails. I wrote a couple books! Get them today!